A host of facilities are provided around the Fiveways Roundabout on the A11. There is a third service area, with a McDonald's and Shell, signed as services but without any advance signage. This and the southbound services can be accessed in both directions - the northbound services can't. 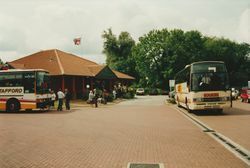 Coaches parked outside the AJ's restaurant. The northbound side is also home to an ambulance station. The roundabout was built in the 1960s, with two garages: one where the northbound services is and one where the third Shell is. The road was then dualled in 1986, and a new Little ChefHistory, Little Chef Lodge and petrol station soon opened on the south side. An AJ's opened next to the northbound site. In 1998, the AJ's became a second Little Chef, while the original gained a Burger King. In 2002, the south side Little Chef became a Little Chef Choices, gaining a Harry Ramsden's and Caffe Ritazza. These were removed, and the Burger King was then replaced by Coffee Tempo!. At one point, the northbound Little Chef gained a takeaway service, but in 2012 it was closed as part of nationwide cutbacks. The filling station supplier changed from Total to Esso around this time. In 2013 a Burger King was reintroduced to the southbound Little Chef. 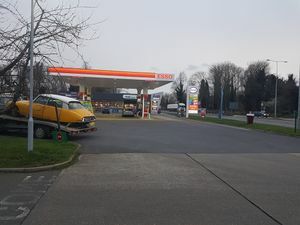 The southbound petrol station was Esso's last trunk-road site before it was sold to MRH in 2015. The shop was damaged by a severe fire in April 2017, thought to have started with an electrical fault in a refrigerator unit. The filling station was rebuilt during 2017 and early 2018 and reopened in May 2018. The southbound filling station is now operated by MFG following the merger of MFG and MRH. The former southbound Little Chef closed in 2017 following the takeover by Euro Garages. Euro Garages subsequently closed their own facilities in summer 2018 ready for refurbishment in September 2018. Greggs replaced EG Diner with Burger King receiving a refurbishment in the process. These new units opened in autumn 2018.